Susan has been practicing her unique style of caring and direct therapy for over 20 years. She emphasizes honest appraisal and guided self-reflection as a means of confronting issues head-on. In addition to general practice for individuals, couples, and family, she is experienced in successfully counseling workplace issues including trauma, job changes, employee/employer relations and other HR-related conflicts. Having practiced for over 20 years, Susan provides a safe confidential and comfortable environment; for individuals, couples and families to explore different options to create changes in their lives. Skype counseling may be offered for a fee after initial in office consultation. Susan is also a published writer. 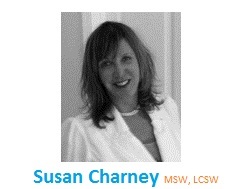 Susan is a Diplomat in Psychotherapy and a member of the National Board of Cognitive Behavioral Therapists, and a recent member of WATT(Women at the Top). She has worked at ground Zero (1 year anniversary at the site), and the military hospital in Landstuhl Germany; and worked with soldiers (Iraq and Afghanistan) and their families.